GeneCluster 2.0 is a software package for analyzing gene expression and other bioarray data, giving users a variety of methods to build and evaluate class predictors, visualize marker lists, cluster data, and validate results. GeneCluster 2.0 greatly expands the data analysis capabilities of GeneCluster 1.0 by adding classification, class discovery, and permutation test methods. 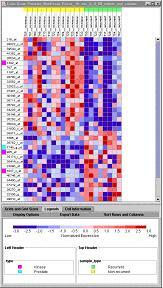 It includes algorithms for building and testing supervised models using weighted voting (WV) and k-nearest neighbors (kNN) algorithms, a module for systematically finding and evaluating clustering via self-organizing maps (SOM), and modules for marker gene selection and heat map visualization that allow users to view and sort samples and genes by many criteria. GeneCluster 2.0 is a standalone Java application and runs on any platform that supports the Java Runtime Environment version 1.3.1 or greater.